The Coco collection features bold Swarovski pearls with Swarovski iridescent crystal accents. Let Coco move your look effortlessly from career to evening to jean comfort! The Coco earring is a staple to one’s wardrobe, the classic pearl can be worn day or night and is something every woman needs to include in their jewelry wardrobe. 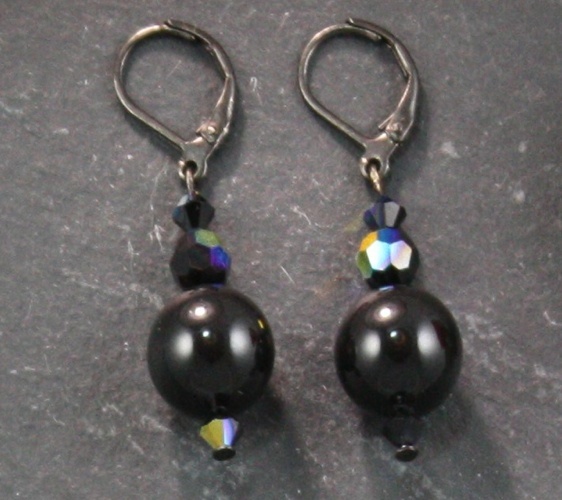 The Mysterious Black Pearl, this black pearl earring is alluring and attractive. • Great bridesmaid earrings, career jewelry, holiday jewelry, or just everyday! • Matching Coco necklace available also coordinate with the Grace necklace. • Perfect earrings to pari with a little black dress! "In order to be irreplaceable, one must always be different," - legendary French fashion designer, Coco Chanel.